While I have started work on a new book – about another Confederate Civil War figure, I keep my hand in covering national security and national defense. Below is a sampling of recent work on current issues posted in a number of places. As could be expected, there is also a listing of Civil War pieces that were done for the Civil War Monitor and the Disunion series in the New York Times. I was more than a little sad to see the Disunion series end in spring 2015. For me personally, it was a great honor to be published there and to be included in the first volume of the collected columns through 2013. I love to read, primarily non-fiction, but also mysteries – the Scandinavians, the British, the Scots, the Cajuns, the Chicago Polish, and the Washington Greeks, so I included a few reviews that I have done since I retired. A more quiet piece of work, but extremely satisfying, has been conducting interviews for the oral history program of the Naval Historical Foundation. The most recent was with Captain Victor Delano, a Pearl Harbor survivor on battleship West Virginia, who died in 2014. 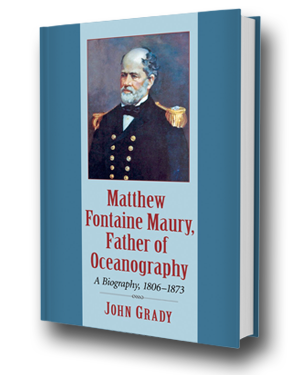 In becoming “a useful man” on the maritime stage, Matthew Fontaine Maury focused on the ills of a clique-ridden Navy, charted sea lanes and bested Great Britain’s admiralty in securing the fastest, safest routes to India and Australia. He helped bind the Old and New worlds with the laying of the transatlantic cable, forcefully advocated Southern rights in a troubled union, and preached Manifest Destiny from the Arctic to Cape Horn. And he revolutionized warfare in perfecting electronically detonated mines. Maury’s eagerness to go to the public on the questions of the day riled powerful men in business and politics, and the U.S., Confederate and Royal navies. He more than once ran afoul of Jefferson Davis and Stephen R. Mallory, secretary of the Confederate States Navy. But through the political, social and scientific struggles of his time, Maury had his share of powerful allies, like President John Tyler.